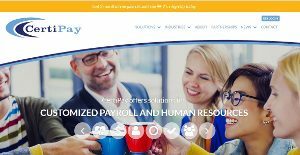 CertiPay is a comprehensive payroll/HR management system that helps companies accelerate growth. It helps organizations to focus more time on core business activities instead of spending countless hours on payroll, tax management and compliance issues. CertiPay follows a client service model and has no call center services. The payroll data functions can be seamlessly integrated with human resource management, time and attendance, and benefits administration. It eliminates the risk of ACA compliance issues and unfulfilled tax obligations through its tax services and files/handles all employee W-2s. As a result, organizations are able to manage their workforce more effectively and efficiently while reducing administrative costs. Its core features include healthcare reforms, payroll, human resources, time and attendance, benefits administration, and professional employer organizer. In addition to payroll and tax services, CertiPay helps human resources to focus on growth instead of HR hassles. It ensures that HR is in compliance with employment laws and best practices are implemented throughout the organization. The managed HRO services are designed to improve HR performance and reduce costs while ensuring compliance. The benefits management tools provide a real-time view of enrollment status with a click and make it easier for employees to follow enrollment processes. The online enrollment tools allows effectively managing new hires and makes it easier for employees to elects benefits. It eliminates the need of tiresome paperwork involved in manual enrollment processes and allows uploading all plans into the benefits administration system. Administrators also get powerful, yet simple tools to track and compare changes before approvals. The simplified time and attendance solution offers significant ROI and saves time and cost by limiting potential errors. It provides various time and attendance options to eliminate manual preparation of paper timesheets and consolidates attendance records automatically, which also improves accuracy. The solution helps identify and address compliance-related issues before they turn into real problems with its repotting tools. Tracking and reporting keeps managers informed in real-time as the solution provides a single-source technology for Payroll, HR, benefits administration and time, and attendance. The solution particularly suits industries, including non-profits, banking, healthcare, law firms, and hospitality management. Enterprises have unique wants and requirements and no software platform can be ideal in such a situation. It is pointless to try to find an ideal out-of-the-box software product that fulfills all your business requirements. The wise thing to do would be to modify the system for your unique wants, employee skill levels, budget, and other elements. For these reasons, do not hasten and subscribe to well-publicized popular systems. Though these may be widely used, they may not be the best fit for your specific needs. Do your groundwork, investigate each short-listed system in detail, read a few CertiPay reviews, call the seller for clarifications, and finally choose the app that presents what you want. How Much Does CertiPay Cost? We realize that when you make a decision to buy Payroll Software it’s important not only to see how experts evaluate it in their reviews, but also to find out if the real people and companies that buy it are actually satisfied with the product. That’s why we’ve created our behavior-based Customer Satisfaction Algorithm™ that gathers customer reviews, comments and CertiPay reviews across a wide range of social media sites. The data is then presented in an easy to digest form showing how many people had positive and negative experience with CertiPay. With that information at hand you should be equipped to make an informed buying decision that you won’t regret. What are CertiPay pricing details? What integrations are available for CertiPay? If you need more information about CertiPay or you simply have a question let us know what you need and we’ll forward your request directly to the vendor.